Grainy photo, but you get the point. 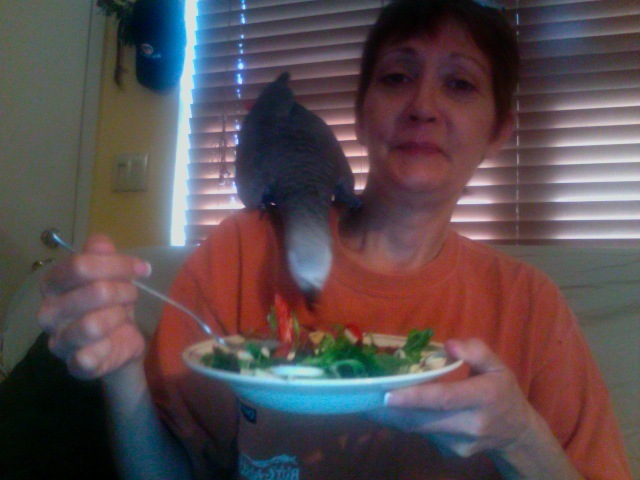 What is fine dining to a parrot? No, this is not a rhetorical question. I’m really asking. I think fine dining for a parrot is, or should be something that is not only good for them, but is fun for them as well. Now Parker’s idea of fine dining is eating directly off of my plate. I eat pretty healthy stuff most of the time. Salads with a bit of protein on the top with some hard boiled egg, some beans and some feta cheese. I love that stuff and I tend to eat this way often. Naturally, the little hog goes right for cheese and the meat, as if to say, “Whoah! Now this is something I can sink my beak into.” while he tucks into it as if I hadn’t fed the little dude for two days. Now I can get away with this occasionally because of their staple diet. They are on a really good diet. Between all of the “Chop,” and their bean mix which has a ton of vegetables in it, my guys eat really, really, well. They tend to be “every other day” heavy eaters. I’ve asked them about that, but to date I’ve received no answers. They just eat heavily on one day and lightly the next. This has been going on for years and if anyone can explain this to me, I’d love to know why. When it comes to their food, I don’t screw around. Aside from all that “Chop,” their bean mix, and some of my vegetable leftovers, they also get toppings of bee pollen, nuts, some fruit and milk thistle seed. So they’re in pretty good shape. Every year their Avian Vet, Sam Backos sort of quietly shakes his head and says, “I wish I could find something wrong with Parker, but he’s in terrific shape.” This makes me smile because I know Sam’s kidding me. 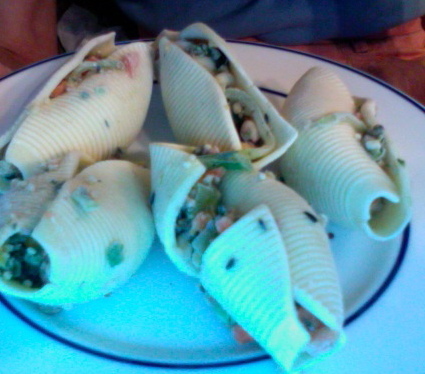 I took some pasta shells and stuffed them with “Chop.” They hit the deck. I guess I’ll have to come up with something else because that little gem struck out. Now if I had stuffed them with cheese, that might have been another story. I’m surprised the stuffed pasta shells (with CHOP) didn’t receive a warm reception! Our birds would have woofed that all down. I know! I was shocked that they didn’t like them. The only thing I can think of was that they didn’t like the size. Love the first picture. I go through that myself every single day. Unfortunately, it’s with a green cheek conure who is (for now) quicker than Scout (my grey). Have you tried explaining that cheese isn’t in their best interest to eat constantly? I tried explaining that to Dizzy, the green cheek. She replied, “Yeah!” in that little husky conure voice, and dove right back into my plate. Scout will stay on her perch and whine (much like a dog) until we give her a bit of what we’re eating. However, the little green monster is fully flighted and will gladly dive bomb onto any food you might be trying to enjoy right then. If you ever find a good Manners and Customs school for birds, please let me know. Maybe if you tried it with penne, so that it would be easier to get their toes around? My grey, Timothy, loves cheese and meat too. I don’t give it to him often, but when I do he goes crazy and whistles and makes a ‘mmmmmmmmm’ sound. It is a process getting their diet converted fully to chop, beans and other healthy stuff. But I am determined to make it happen. How long did it take your birds to eat so healthy? You are such a wealth of inspiration and information. Love the first picture. I go through that myself every single day. Unfortunately, it’s with a green cheek conure who is (for now) quicker than Scout (my grey). Have you tried explaining that cheese isn’t in their best interest to eat constantly? I tried explaining that to Dizzy, the green cheek. She replied, “Yeah!” in that little husky conure voice, and dove right back into my plate. Scout will stay on her perch and whine (much like a dog) until we give her a bit of what we’re eating. However, the little green monster is fully flighted and will gladly dive bomb onto any food you might be trying to enjoy right then. If you ever find a good Manners and Customs school for birds, please let me know.